Just click here, or on the video image above, to access this free HOW-TO video. 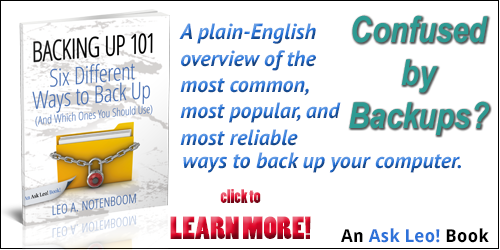 You may remember that some months ago I asked for suggestions on what backup program I should add to my toolkit of recommendations. 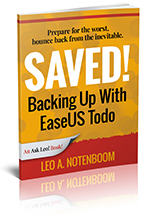 Thanks to your feedback, which included not only Todo, but several other worthy contenders, I investigated, I played, I backed up a few times, and came to the conclusion that EaseUS Todo would get my recommendation. 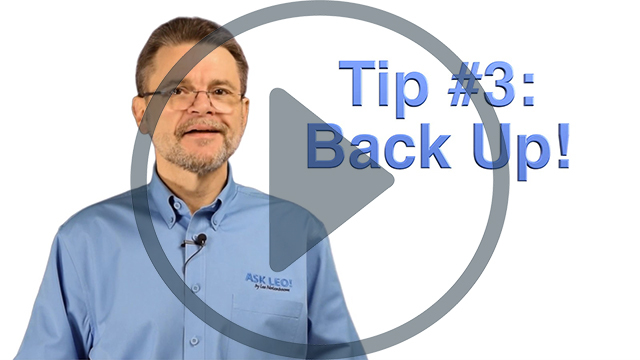 Continue Reading: Tip #3: Back Up! I always thought an i7 was better than an i5, which was better than an i3. Based on the above, is the Acer CPU better (as in more powerful, efficient, and faster) than either of the i7s? And why would one i7 (the SYX) be about 75% faster and more powerful than the Sony i7? To call it confusing only scratches the surface of the processor nomenclature and configuration. In my opinion, it's more complex than mere mortals can comprehend. Sadly, I am but a mere mortal. However, I will share my priorities, which the average consumer may share when selecting a computer. In so doing, I'm sure I'll annoy some of the geekier members of my audience. I'll also look at a few more things about the processor configuration mix, and compare the three processors you list. Continue Reading: What's the difference between i3, i5, and i7 processors? For a home user with no special programs and no gaming, am I better off with a single core processor or a dual core processor? I play no games. I simply have a few usual things (word processor, registry cleaners, anti-spy and security stuff, etc.) but I need a new PC. This one is over 10 years old. It is SLOW even after cleaning the registry, defragging, optimizing, and everything else. Would I be better off with a dual core or a single core processor? Normally, I stay away from specific processor recommendations because things change so much, and so often, and I'm just not one of those people that wants to do a detailed comparison between processor A and processor B. There are plenty of other passionate people who'll happily do that all day long. In this, however, I do have an opinion: more cores may be better, but too many may not be worth it. Continue Reading: Should I get a dual core or a quad core processor? Can a MAC address be traced? A CPU, or "Central Processing Unit", is the circuitry that actually performs calculations and executes the instructions of computer programs. You may think of it as the brain or engine of your computer. Most desktop computers originally used a single processor chip containing a single core or CPU. A computer may now also have a single processor chip with multiple cores, multiple processors with single cores, or multiple processors with multiple cores. Regardless of the configuration, multiple cores allow a computer to quite literally do two or more things at the same time. I agree it's great to learn new stuff. But, you know, I still use WORD 97 and MS WORKS 4.5 for my documents and spreadsheets, respectively. For some reason, the powers to be (namely Microsoft) keeps improving their products, even when the need does not exist. It's called marketing. with W7. Why bother with W10. I moved up from XP and indeed there was an improvement. I guess when I see the need, I'll do the W10 stuff. I do agree it is good to learn new stuff. As an old guy (turned 69 years old recently) I am also aware of studies that show constant brain exercise, especially learning NEW stuff, helps ward off Alzheimer's and other forms of dementia. But it doesn't even have to be computer-related. My wife and I recently took dancing lessons, and we loved it. My wife also started doing Facebook and she spends quite a bit of time on her computer. That's great as it gives me more time to play online poker! Having used computers from an early age, I am quite pleased how far things have come. And then, lol, I have to teach someone how to copy paste. I'm glad there are people such as yourself interested in guiding the computer illiterate, and I commend you for your patience. I am currently teaching a relative how to use her computer, and it is amazing how much resistance she puts up in learning basic tasks. I believe that the parable of teaching people how to fish is wise, it just seems to be an upward climb with the older generations. Good luck with your site and videos, I will be directing people here in the future, no doubt. I didn't like the ribbon either when it was first forced upon me. However, as using Office 2010 was my only option at work, I worked with it. Now I wonder how I ever got along with menus before. The ribbon is just faster. Just like you learned where everything was in the menus, you'll soon learn where everything is in the ribbon. And you can even make your own Quick Access Toolbar with your most commonly used options. I do so agree with you Leo! Keeping the old gray matter excercised is so important and the best way is to keep on learning! Your advice to take it easy and slowly and practice is also very important to 'get it'. However the older I get the feeling of not having enough time left to grasp everything aggravates me and makes me want to skip over stuff. I have to stop myself from doing that(getting better at it, tho' it does take work ;-) . Thanks for the reminder. Love your videos and all the help. Carry on!